Current legislation and plans for the Sacramento–San Joaquin Delta (Delta) call for large-scale restoration of aquatic and terrestrial habitats, which will require significant changes in waterways, land uses, and cultural patterns. These re-made landscapes will be subject to a variety of new human uses, which Delta planning and adaptive management literature has yet to adequately consider. Failing to account for human uses and evolving place values can lead to diminished performance and public support for Delta restoration efforts. Our empirical study examined restored and naturalized Delta landscapes using an integrative landscape approach that seeks to reconcile multiple goals and land-use agendas that span ecological, social, economic, and political domains. The research design consisted of six overlapping methods that included a planning, policy, and law review specific to the Delta; surveys and interviews with approximately 100 land managers, scientists, land-owners, law-enforcement personnel, agency representatives, and Delta residents; nine case studies of restored and naturalized delta landscapes; GIS mapping; and extensive field work. Findings derived from the synthesis of these methods show that human uses of the Delta’s re-wilded landscapes are diverse and pervasive. Given the infrastructural and urbanized context of the region, these environments are subject to multiple and sometimes conflicting uses, perceptions, and place values. Though these myriad uses cannot be fully predicted or controlled (nor should they be), findings showed that more proactive and inclusive planning for human uses can encourage or discourage particular uses while also building constituency, support, and active engagement in ecological restoration efforts. 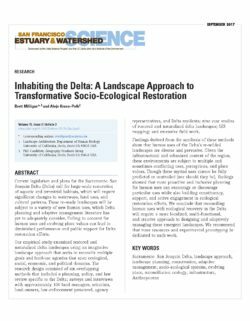 We conclude that reconciling human uses with ecological recovery in the Delta will require a more localized, multi-functional, and creative approach to designing and adaptively managing these emergent landscapes. We recommend that more resources and experimental prototyping be dedicated to such work. 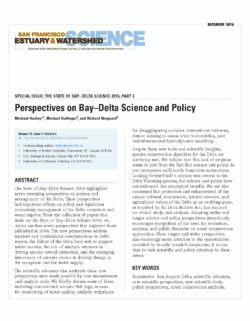 Delta science needs to push beyond its tendency to focus on short-term policy mandates and near-term crises. Taking a longer, 50- to 100-year viewpoint has been part of various planning exercises including Delta Vision. 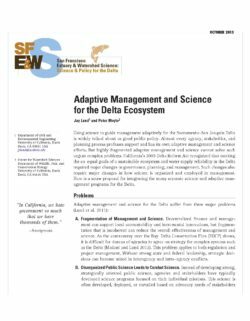 That kind of long-range thinking now needs to be more strongly incorporated into the whole Delta science and management endeavor. An appreciation of the changes that are coming, particularly those associated with climate change, needs to inform all our research and planning. In the meantime, despite management actions that in some instances appear heroic, native fish continue to decline in the Delta. The food web has changed dramatically, new stressors are added daily to existing ones, and several native species are virtually extinct. While we must continue to try to shore up the delta smelt, for example, it is time for serious debate about more radical alternatives to habitat restoration, including assisted relocation, assisted evolution, even perhaps cryopreservation (freezing of genetic materials). Agency mandates based on the past should not prevent us from taking actions that prepare us for a very different future. The capacity of the Delta to absorb extremes of all kinds is declining. 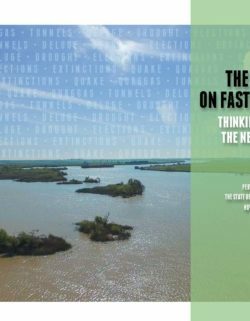 In the future, water managers will have to adjust to reduced and more variable inflows to the Delta and to less predictable sources of water supply. Sustaining a Delta ecosystem hospitable to native species will be much more difficult. In that case, it may become necessary to refocus on managing for novel plant and animal communities that provide desirable ecosystem services. Delaying action until the next crisis is upon us will greatly increase the risk and costs of failure.